Hellooooo! To all you 0L's out there, application time is coming up! I have actually had to ask for application rec letters twice since I had to get some for when I originally applied and then again when I transferred and I know they can be a pain, but you have to do them for your application. Today I'm walking you through a step-by-step process of how to get a great rec letter. Ideally you'll start on this sooner rather than later because it just makes it easier on yourself. I wouldn't really worry too much about this your freshman year because you're still adjusting from high school and usually end up taking lots of basics your first year of college, but if the opportunity presents itself definitely take it! If you're like me and like to overthink and have a game plan, here's what I would do. Obviously you want to be aiming for B's and A's in all of your college classes because you're going to want a good GPA when you apply to law school so step one would be the obvious of plan on doing great in all of your classes. About once a month, visit your professors office hours so he/she can get to know you. A head's up email to them is always polite but you definitely can just drop by during their office hours. If you have class or our busy during their office hours, you can instead email them and set up a time. This is a great time to make sure you're fully caught up and understanding what's going on in class to help you get those good grades, but it doesn't have to be a full-on study session. A quick 10-minute drop by just to ask a question or get clarification is enough to get a rapport going with your professor. During these office hour times, it is great to casually mention something like how you especially want to do good in their class because you hope to go to law school or somehow find a way to plug in law school. As the semester progresses, you might notice that some professors are just not a perfect fit for you that probably wouldn't be your best bet to ask for a rec letter, and that's okay. Hopefully you'll find at least one professor who you really click with, are doing great in their class, and you think they would have the time eventually to write you a fabulous rec letter. At the end of the semester you could sign up to take another one of their classes so you can continue on building this relationship (if it works with your schedule) or if you don't think you'll be seeing them in class again then you can go ahead and ask them if in a year or two they'd be willing to write you a letter. Keep repeating every semester until you graduate! Number 1 this will help you have great grades because you're putting in more-than-average effort into this class. And number 2 it's always great to have a stash of available professors for rec letters! Some may be willing to now but then get busy or move before you need them (or even say no) so it's best to have more than you need. Plus you can always use these recommenders for things like scholarships or program applications too! If you waited until the last minute to ask for rec letters, don't worry you're not totally screwed! Sit down with a copy of your transcript and look back on what classes you did the best in. Remember that law school is a graduate school so ideally your rec letter will sing your praises as a law student, and someone can't exactly do that if you barely got a C in their class. Then go through this list and think back to your relationship with your professors and pick the top 6 (remember it's always better to have more for backups) that you really got along with and schedule a time to come visit their office hours. Some people to look at our professors from classes where you participated in a lot (for me these tended to be smaller classes) or people who were a faculty advisor for something that you were involved in. One important thing for finding a recommender no matter what year of college you ask for it— choose the person not the class! I mean obviously if you did well in business law or any college class that was taught by a lawyer then they will really be able to know if you're law school material or not and talk on that. But seriously, if you got along way better with your Anthropology professor than you did with your PoliSci professor, pick the Anthropology one! Law schools won't weight one professor over another just because of what class it was. They're looking for some reassurance that you're a great learner who will be able to survive a studious workload, and they don't really care which professor is saying so. Anyways, stop by as soon as possible for a little reunion. Since some professors have literally hundreds of students each semester, you're probably going to have to remind them of who you are. Remind them what class you took with them and in what year, and what grade you got. It would be helpful if you had a graded paper or test by them to bring with you to help jog their memory or at least show how you performed in their class so they don't feel like you want them to make up parts of their letter. Ask them if they'd be okay with writing a letter and then schedule a follow-up meeting to discuss the rec letter if you're running out of time or go in to your request right then and there. First off, make an appointment with your professor for when you ask them to write a rec letter for you. I think it's much more polite and professional to ask for a rec in person rather than in email. Do this ideally at least a month before you need the letter because you don't want to be cut-off halfway because they already had plans with another student or professor. Take this time to make sure that they understand 1) that they're writing this rec letter for law school; 2) why you want to go to law school; 3) why you want them in particular to write a letter for you; 4) how they will have to go to LSAC and upload their rec letter; and 5) a due date 2 weeks before you actually want to have the letter in (because they get busy). On the day you go to ask your professor with a rec letter, make sure you bring a copy of your law school application resumé with you! 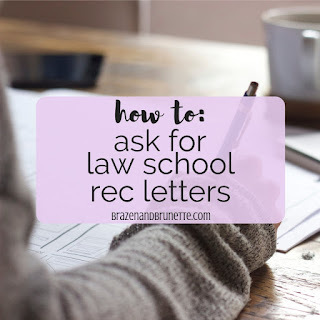 It'll help your recommender know even more about you and why you would make a great law student so they can mention some of that in their letter. This can be longer than your law school resumé if you have even more involvement, accomplishments, or anything else that you think might be helpful for them to think about as they're writing your rec letter. Oh, and definitely make sure you have your GPA on it because at first I didn't have that but then had a professor ask for it. If you have good grades and feel comfortable showing these to your professor, it's okay to print off a copy of your transcript. This way you can talk to your professor and point out some of your other strong areas. So if in my example above you're asking your Anthropology professor to write a rec letter but all your work in that class was multiple choice quizzes and tests, you could point out if you've been getting good grades in writing classes so that they know you're also a good writer. They might not end up needing/using this information, but it's nice to have a little packet all ready for them to make it easier on them to write a great and compelling letter for you. One tip I have for all law school applicants is choose quality over status! I know this post has been all about professors, but really you can ask a wider variety of people for rec letters. But I have heard over and over again about how political figures in your community or who you have interned for tend to have a rec letter template that is completely generic and used for you and the 3 people who also asked for a rec letter that same day. And partners at a big law firm that you interned for over the summer are usually just as busy and sometimes have a member of their staff write something about you for them, which again will probably a little generic. If this person did not get to personally know you, don't waste your time. The ideal rec letter would be enough that it could convince the ad com committee that they just have to admit you to their school. Sure, they probably won't based off only this one letter, but it definitely won't help. 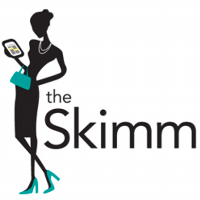 Don't procrastinate and stay on top of your due dates! Remember that these people have full-time jobs and most likely a family, too. They're busy and have papers to grade, conferences to attend... you get the point. You want to be able to give them enough time to write the rec letter because it's just really rude to ask them to do you a favor, but then be demanding that they set aside their entire life to do you this favor right now since you waited until the last minute. If you haven't heard back from them for a few weeks after you asked, you might want to send a follow-up email reminding them of your highlight points and due dates. Basically enough information that they could quickly type something out on their phone right then before they go to bed. Do as much work for them as possible! After you leave their office, go to LSAC and register them as a recommender (here's how to do that). Fill out as much as you can and have it all ready for them just in case they decided to upload your letter that day. You probably still can't navigate around LSAC that easily, so imagine how confusing and frustrating it would be for someone who has maybe never even heard of LSAC. Remember that you're the one asking them for the favor, so try to make to make it as easy as possible for them so they don't end up regretting it. Especially because you never know if you'll need them to write you another rec letter in the future.